Processor Only. ·Our ad will indicate whether the item is fully functional with an OS and listed as:Tested for Full Functions, R2/Ready for Reuse. Products with this label are sold and are equivalent to new products, ready to be used out of the box with minimal setup. PROCESSOR TYPE Pentium. If you prefer you may also feel free to recycle such materials to any local R2 or e-Stewards certified recycler. All Red Door Processors are tested. L2 CACHE 512KB. CLOCK SPEED 3GHz. Trending at $8.21eBay determines this price through a machine learned model of the product's sale prices within the last 90 days. Tested Perfect passed 1 hour stress test. All Potentially Defective Product claims should be directed directly to the manufacturer or warranty provider for evaluation and warranty support. Refer to the products' individual warranty policy for further information. Tested Working. Grade A Condition. 3.2 GHz Processor. Processor removed from working system. Once you send it out to a third party we cannot help you. We do not test batteries; only provide indication that they are present or missing with photos or in the item details. Removed from working machines. Tested and in good working order. Tested for KeyFunctions, R2/Ready for resale. # of Threads 12. Processor Number E5-2640. Processor Base Frequency 2.50 GHz. Launch Date Q1'12. Expected Discontinuance Q2'15. Cache 15 MB SmartCache. BE AWARE ALL PRODUCTS HAVE A LABEL FOR WARRANTY PURPOSES, DO NOT REMOVE IT BEFORE YOU DO THE NECESSARY TESTS. Model E5630. Processor Type Xeon. Rack & Rail Kits. Tape and Storage. ServerPartsFast is an independent distributor of servers and components located in Atlanta, Georgia. We Buy, Consign, and Recycle Servers. Freight quote is to the lower US 48. Processor Number W3580. Processor Base Frequency 3.33 GHz. Max Turbo Frequency 3.60 GHz. Bus Speed 6.4 GT/s QPI. Datasheet View now. Embedded Options Available No. Advanced Technologies. Low Halogen Options Available See MDDS. Trending at $34.34eBay determines this price through a machine learned model of the product's sale prices within the last 90 days. Core 2 CPU/Processors. Dual Core CPU/Processors. Point of Sale. Generic Picture Used. Bare CPU/Processor only. Apple & Mac. Cables Connectors. Power Protection. ( 100% Fully Tested Working From My Supplier )! The sale is for the CPU and Thermal paste only! Processor was pulled from working system. Condition is Used. This is just the processor (there is no box, fan, heat sink, instructions, etc.). I've shown pictures of the ones that I have available. It's made to last and it's truly the largest difference between the stuff you "can get" and the stuff you must have to change the way you compute. Whether it's a laptop, desktop, LCD, printer or one of our other amazing deals, each piece is coming to you off-lease. Intel Xeon X5460 3.16GHz/12M/1333MHz Quad-Core CPU Processor SLBBA. Tested, fully functional. Ships quickly and carefully. Thanks! OEM part # at80614005133ab. AT80614005133AB is an OEM/tray microprocessor. Core stepping B1 (Q4EQ, SLBV8). CPUID 206C2 (SLBV8). Socket LGA1366 Six Core. Socket Socket 1366 / B / LGA1366. 1.5MB (6x 256KB) L2, 12MB L3 Cache. Trending at $23.99eBay determines this price through a machine learned model of the product's sale prices within the last 90 days. Tested and in working condition. Processor Model Xeon X5675. Compatible Slots 1 x processor - LGA1366 Socket. Multi-Core Technology Six Core. Processor Quantity 10. Product Identifiers. Product Type Processor. CPU Socket Type LGA 1366/Socket B. Model: Core i5-3570. No Exceptions. Pulled from a working system. Model: Core i5-650 / SLBTJ. Smart Cache Size: 4MB. Type: CPU / Processor. Working Condition: Technician Tested - Tested for Full Functions, R2/Ready for Reuse. We have since grown to be a large scale electronics recycling, asset recovery center. Socket G34. Opteron 6380. CPU Socket Type. 64-Bit Support. Hyper Transports. Max Turbo Frequency: 3.20 GHZ. CPU Speed: 2.60 GHz. Number of Cores: 2. Provide secure & responsible electronics recycling through our Tech Dump division. 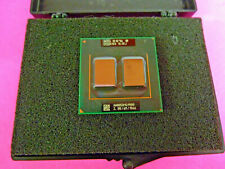 Model: i5-560m 2.66GHz Dual-Core (SLBTS). Summary: 1 CPU. Sold as used and in working condition. Condition: Used, fully functional (may have silver paste on it). Processor Base Frequency 3.10 GHz. Max Turbo Frequency 3.80 GHz. Bus Speed 8 GT/s QPI. Datasheet View now. Embedded Options Available No. Advanced Technologies. Low Halogen Options Available Yes. TCASE 67°C. Grade A | Clean Pulls | Free same day shipping. I have tested the cpu's on my board and these unlock to an AMD Athlon II X4 559 3.4 Ghz with the right motherboard that supports this feature. It has been tested on a compatible motherboard and is working great. Nothing else is included. Socket Type: LGA1155. L3 Cache: 6MB. We can then adjust your invoice before checkout. Requesting an Updated Invoice. Intel Core i-7-4770K 3.5gHz Quad-Core Processor. Condition is Used. Shipped with USPS Priority Mail. Processor Model: E3-1220V2 Socket Type: LGA 1155. CPU Socket Type. Processor Type. Processor Family. Virtualization Technology Support. 64 Bit Support. 5.00 GT/s DMI. Front Side Bus / QuickPath Interconnect. CPU has been fully tested! Model: ADX6000IAA6CZ. Socket : AM2 / AM2 125 WATTS. AMD AT HLON 64 X2 Dual Core 6000 PROCESSOR. To protect the pins, the processor will be placed in a. 3.0 GHz,1000 MHz Hyper Transport Lin k ,2MB L2 CACHE. Set of 2 DELIDDED - 6-Core each (12 Core). Xeon x5680. We carefully remove the lid and most of the glue and then we polish the solder/tin to a smooth, buttery finish. This will allow an excellent bond between your thermal paste and your heat sink.